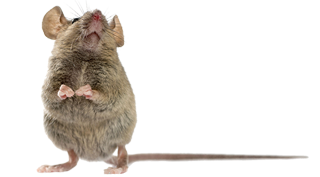 Mouse Removal and Pest Control Services | Full-Service Extermination Solutions! Mice, commonly mistaken as rats, are rodents that are commonly found lurking in homes in Michigan. The most obvious difference between a mouse and a rat is size; rats are much bigger in size and darker in color than mice. Do you need more facts about mice or how to get rid of mice in your home? Look no further! Mice are a very common rodent found in Michigan. They do not hibernate, so be sure to take the appropriate precautions as the weather cools down. Adult mice typically grow to be about 20 cm long and weigh anywhere from 12 to 30 grams. They range in color from light brown to gray to black, with short hair covering their bodies. Mice also have a tail. What is typical mouse behavior? Mice are very inquisitive rodents. They build their nests in dark, protected areas, and tend to find home in grassy and wooded areas, as well as farm fields. They are opportunistic feeders who will eat anything, but they prefer seeds and nuts. They typically gain entrance to your home when temperatures drop, as they do not hibernate and are attracted to the warmth and smell of food. These rodents enter your home through gaps beneath doors, pipe openings, and utility lines and tend to reproduce quickly, making them a liability if they gain access to your home. How do I know there are mice in my house? Mice leave a lot of evidence behind indicating their presence. The most obvious indication is the presence of mouse droppings. These pellets are approximately 3 to 6 mm long and rod shaped with pointed ends. They also leave footprints behind when they are scurrying around your home. These rodents also leave evidence of their gnawing and chewing, particularly wood shavings and teeth marks. They also make sounds, especially at night, where they can be heard running and gnawing and sometimes even squeaking. Finally, these rodents communicate with their urine, so there is a possibility that you may smell a distinctive odor if there is a large mouse population present. One preventative measure you can take against mice is to seal all cracks, crevices, gaps, and holes larger than a pen cap with cement. Do not use wood, as these rodents can chew through it. Cleanliness is also a factor with mouse infestations. Be sure to seal all food in a glass or metal container with a tight lid, and also make sure to wash dishes after use. A major hydration source for these rodents is from scavenged food particles, so keeping crumbs and food morsels off of floors and counter-tops can also help keep them out. However, if mice have already invaded your home, these preventative measures will not help. At that point, it is highly suggested that you call your pest control professional to help exterminate the problem. At Hi-Tech Pest Control, we have the specialized equipment and knowledge to eradicate your mice infestation. Call us today or schedule your free inspection! Learn more about common bed bugs including rats and spiders. Hi-Tech Pest Control has a wide variety of commercial Integrated Pest Management programs. We also offer residential IPM programs to fit your preventative pest maintenance needs. Call us at 248-569-8001 to start your Integrated Pest Management program today! From Pest Heat Treatments to Chemical Pest Treatments, we are your one-stop source for pest maintenance. Whether it crawls, flies, bites, or destroys — no matter how in-depth your pest problem is, Hi-Tech Pest Control can solve it! We pride ourselves on doing the jobs those other guys can’t do. Plus, with a 6-month money back guarantee and a free inspection, you have nothing to lose. Call Hi-Tech Pest Control today at 248-569-8001 to schedule your free inspection!